Why I cannot open PST file? Most of the Outlook users view this error message when they start Outlook but do not know why this error message occurs – what Outlook users know is that they cannot open PST file. PST has been damaged, corrupted or lost. Reasons like unexpected system shut downs, virus attacks, Outlook errors, etc. Due to damage of the PST file, MS Outlook could not either locate the PST file or understand the file format, hence cannot display emails, contacts, notes, tasks, etc. in your Outlook profile. In the specified, error message, Outlook suggests closing all email applications and using Inbox Repair Tool. 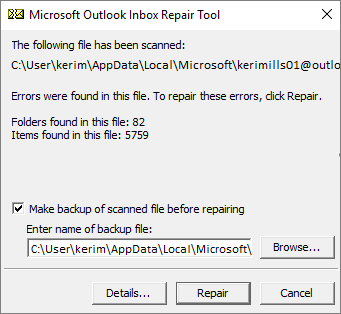 Here, you might be thinking that what an Inbox Repair Tool is and why MS Outlook suggests using this tool. The Inbox Repair tool is a PST repair utility provided to Outlook users by Microsoft for free. 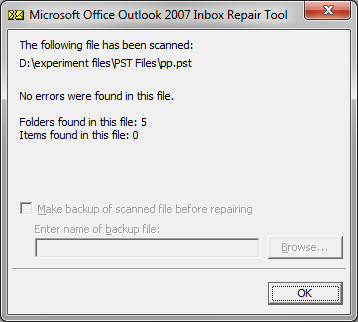 When MS Outlook is installed, the Inbox Repair tool (also called scanpst.exe) gets installed on your computer. The Microsoft provided PST repair utility enables you to repair the damaged PST file and helps you access your emails, notes, contacts, etc. with your Outlook profile. Depending on the version of MS Outlook and Windows operating system, the location of Inbox Repair tool varies. Moreover, you cannot see this freeware PST repair tool in the Programs menu of your Windows operating system; therefore, the easiest way to find the tool is Windows built-in search feature. Step 1: Exit all Outlook services and browse any of the following locations to find ScanPST.exe. Step 2: Double-click on the ScanPST.exe to open the Wizard. Step 3: Select the PST file that you want to repair. Step 4: Click Start to begin and select Repair if the scanning finds errors; it will start to fix them one by one. Is the Outlook Data File that you repaired is in its original structure? In the folder structure of Outlook, you might see a Recovered Personal Folders which stores default Outlook folders and a Lost and Found folder. Lost and Found folder is the folder that contains folders and items that were repaired by ScanPST.exe tool, which Outlook can’t replace in their original structure. So, to get back all repaired data to its original structure, you will have to create a new data file. Step 1: Create a new Outlook data file. Step 3: Now, you can remove the Recovered Personal Folders file along with Lost and Found folder. The Inbox Repair tool successfully repairs the damaged PST file when there is less corruption in the PST. Therefore, if you cannot open PST file even after using the Inbox Repair tool, there is no need to be hopeless. You can use third party PST repair tools that are still there to help you. Kernel for Outlook PST Repair is a result-oriented third-party Outlook PST recovery software, using which you can repair corrupt PST files. Whatever be the size of the PST file, the software efficiently repairs the damaged PST and recovers emails, notes, contacts, tasks, etc. in their original formats. 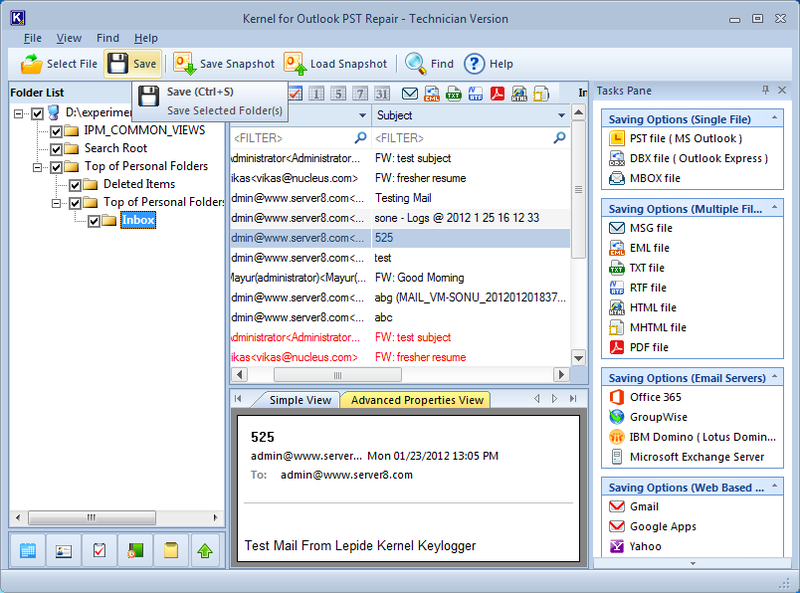 Kernel for Outlook PST repair tool supports all versions of MS Outlook and Windows operating systems. The above-mentioned methods will help you to open your PST file successfully. And, you can happily access your stored data in Outlook and resume to your emailing smoothly. How to make backup copy of a PST file?